The Cy Woods team with their judge and two of their volunteers. What is better than helping the earth? Getting hundreds of people competing to see who can help the environment the most. Texas A&M Forest Service hosted the annual regional tree planting competition on February 11th. 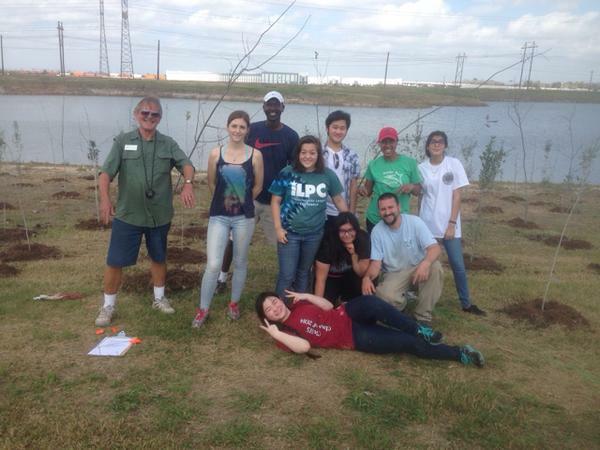 Groups from all over the region met up at Buffalo Run Park in Missouri City to see which team could plant 100 trees the fastest. There were three divisions: professional, amateur and student. Right away, the day was not going as planned. First I slept through my alarm, then we realized that we only had seven people to compete. But the team was still determined to help the environment and plant as many trees as we could, even if it meant not winning the competition; either way, we would be putting some trees in the ground. By the time we arrived, the day was already going better. We reached out planting site, and two volunteers were there to greet us. (Thank you nice couple from Haiti!) Once our judged arrived, we immediately got started. After measuring and placing the baby trees, we got right to digging. Planting trees was a lot more tiring than one would expect. An hour went by before we knew it and we still had over half of the trees to plant. Even with our extra help, we still only had nine people. We were all exhausted, sore and covered in dirt. By this time, word had gotten around that one of the professional teams finished planting all of their teams in only 12 minutes. As we were all diligently digging holes, placing trees and applying mulch, three men from the professional landscaping team decided to lend us a hand. With all of our volunteer’s help, we were able to plant all 100 trees in 2 hours and six minutes. After all of our hard work, we were rewarded with free food. The chef was amazing and the food was delicious. In the end, every team in the student division was disqualified because they all received help from other people, but no one really cared. We were all still happy that we got to participate in such an environmentally friendly competition. Even though it was hard work, and I slept for three hours afterward, I was really proud of the team and our achievement. Although we didn’t get any official award, the fact that we helped the environment and did something good for the world was a reward in itself.